This Week in Veg: No Lettuce! 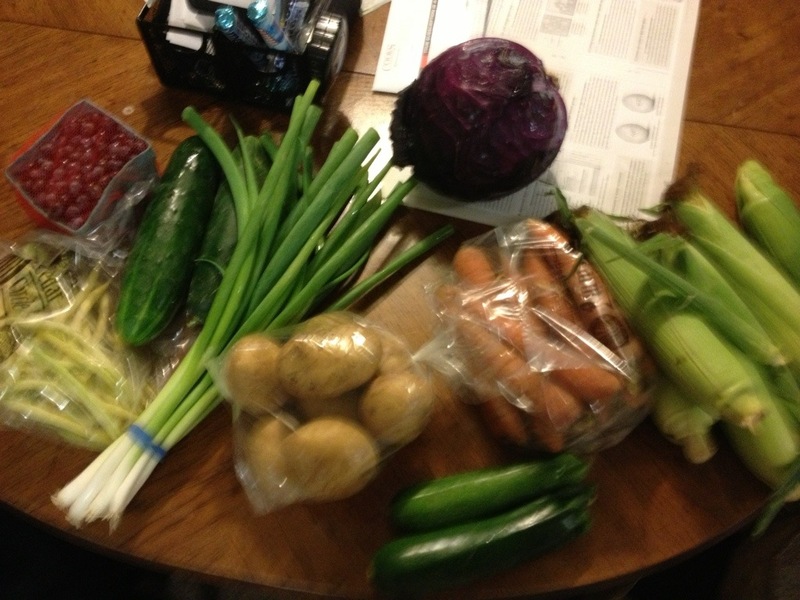 | ReLocavore: Redefining "local"
This Week in Veg: No Lettuce! So this week marks an important transition between spring and summer. We didn’t get any lettuce in our CSA box this week. We also didn’t get any tomatoes in our CSA box. This is very disappointing. What it means is there’s no period of time when the tomatoes overlap with the lettuce allowing us to eat BLT sandwiches. I love BLTs. There is no sandwich, save a simple sandwich made with tomato and mayonnaise, that even rivals the BLT in my opinion. I guess I’m going to have to get up tomorrow and go to the farmers market. Buy some tomatoes, and a head of lettuce, so we can eat BLTs at least once this year. Categories: Farms and Markets, This Week in Veg | Tags: beans, blueberries, carrots, corn, csa, cucumbers, farmstand, green onions, potatoes, red cabbage, Sweet corn, zucchini | Permalink. I’m a de facto vegetarian, but I put it on hold once a year to make BLTs when tomatoes are at their peak. If I’m going to be bad, I decide to go all the way. I buy artisan bacon and good bread. It’s getting toward that time of year. What is it about bacon that weakens the knees of so many vegetarians? Last night I had a couple hands full of grape and cherry tomatoes. I chopped them up, added a handful of bacon that was leftover, cheddar cheese and mayonnaise. We had BLT salad (sort of). Bacon is sin. I remember a couple of years ago when I couldn’t eat it. I think I cried once. PS, I get pissy because my cilantro isn’t in full swing when I have tomatoes and jalepenos. What is with that? Wish I could send you mine. We keep getting big bundles from our CSA but no tomatoes! Lettuce is a winter crop here. Maybe for you too? Nah. It gets too cold too fast for us to have a fall crop of lettuce. Plus, fall is great for growing Asian greens, cabbages, beets, and kale instead of lettuce. You might not have lettuce, but I’ve found that cukes are a great substitution for lettuce. The key is to slice them lengthwise (a mandolin helps) so that you get solid bread coverage. And vegetarians will always have a bacon weakness. It’s not really meat, it’s candy disguised as animal product. We eat BZLTs (zucchini) using the same trick. We cook bacon in the panini press, then the zucchini in the bacon fat, then assemble and toast the sandwiches.